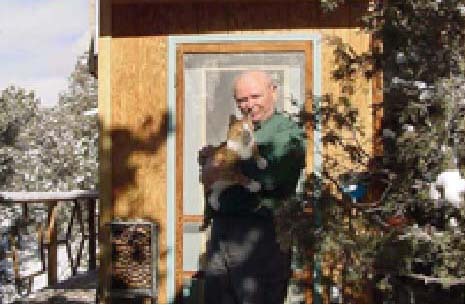 To the left is a photo of Wayne Codling, taken outside his cabin at Crestone, Colorado.. He is 57 years old and has spent the previous three decades deeply immersed in Zen practice as a student of the Beginner's Mind teachings of the late Zen Master Shunryu Suzuki-roshi. Wayne's monastic training took place at the San Francisco Zen Center in California with further experience in New Mexico and Colorado. Today he lives in Victoria, teaching zazen, illustrating its usefullness in a real world setting and serving individuals who want spiritual coaching.